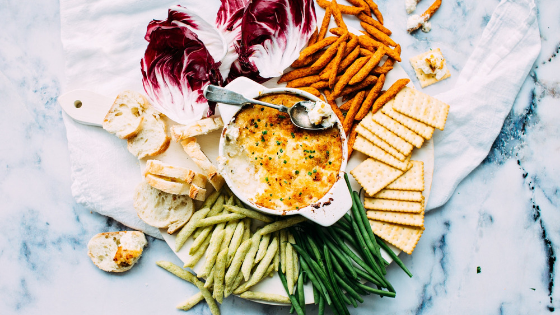 From Thanksgiving to Christmas to New Year’s, your guests will love snacking on this festive spread. Combine all ingredients below and serve it with crackers or gourmet bread. You can even offer it as a veggie dip. Preheat oven to 375°. Arrange sliced bread on ungreased cookie sheet. Brush with butter. Combine cinnamon and sugar; sprinkle bread pieces with the sugar mixture. Bake around 6 minutes, or until lightly browned. Preheat broiler. Combine sweet potatoes, brown sugar, butter and pecans; spread a layer over each slice of toast. Top with halved mini marshmallows. Broil 2 to 3 minutes or until marshmallows are lightly toasted. Combine all ingredients and cook on low heat for at least an hour or until evenly heated. Serve with crackers or bread pieces. Sauté garlic in olive oil for 1 to 2 minutes to bring out the flavor. Add mushrooms and cook 2 more minutes, stirring occasionally. Stir in wine and balsamic vinegar and cook another 2 minutes. Add a dash of salt and pepper. Provide toothpicks or small forks when serving to your guests. The Atlanta apartments at 2460 Peachtree are the perfect place to celebrate the holidays. Contact us today about terms and availability.